Bauhinia kockiana with spectacular blooms all year round! When Bauhinia kockiana blooms, which it does year round in our tropical climate, it’s absolutely a sight to behold! Just look at these amazing flower clusters on lovely cascading branches – pure delight indeed! 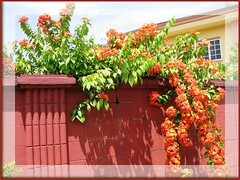 These photos were captured in November 1, 2007 as I stood captivated outside the garden wall of a bungalow in a neighbouring residential area. How wonderful if our Bauhinia kockiana can display such magnificence! 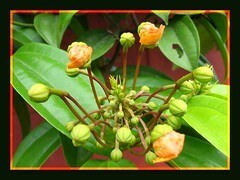 Plant type: A flowering woody climber, native to Peninsula Malaysia. Light: Full sun to semi-shade. Prefers morning sun and afternoon shade. Propagation: From germination of seeds, though Kock’s Bauhinia very rarely produce seed pods in cultivation. Usually, it is propagated by air layering or marcotting of its woody stems. 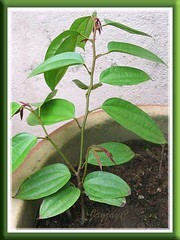 Propagation by normal woody cuttings is not feasible as it is difficult to root. Features: Bauhinia kockiana, a tropical perennial semi-deciduous vine, is quite a vigorous climber that can reach a height of about 10-15 feet in gardens, but capable of scaling much higher to probably 40 feet or more in the wild jungle or forest as it reaches the crown of tall trees. Being vining, it requires support for its woody stems and sprawling branches. Its luxuriant foliage displays ovate to elliptical leaves that are medium green in color, glossy and deeply veined with three distinct nerves running from the base to the apex of the leaves. It bears spectacular clusters of stunning inflorescences, ranging in colors from bright red-orange to orange, and golden-yellow to pale yellow as they age and wither away. 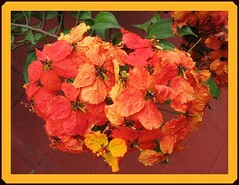 Not only are its blooms long lasting, but it flowers practically throughout the year. 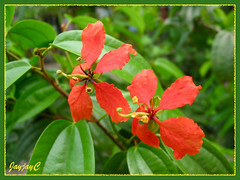 Usage: Bauhinia kockiana is gaining popularity with home gardeners and landscape designers. It can be grown in containers or straight onto the ground. Excellent specimen for trellises, arbors and pergolas, even as a stand-alone at the entrance to a patio. Wonderful espalier for garden walls or chain-link fences. It is used to scale lamp post or trees in parks too for added beauty. 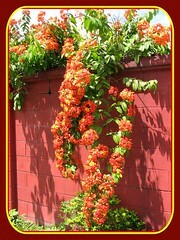 Care: Being a tropical vine, it needs lots of water, sunshine and humidity. Remove burnt and dried leaves or flowers to keep it tidy. Prune after flowering to encourage more branching, hence more flowers. Reduce water gradually once the plant has achieved a luxuriant foliage and feed it with an appropriate fertilizer to induce flowering. If it is a potted plant and located where it receives the direct sun, be extremely careful that it is not water-stressed, otherwise it’ll be scorched. Insect pests and plant diseases are hardly a problem. All in all, Bauhinia kockiana is a relatively easy plant to care. Nevertheless, be aware that a sapling needs some years (?) to establish before it can be a flowering tree. Haha…I really don’t know how long as we gave up hope on our first potted plant that grew luxuriantly to more than 5 feet in less than 3 years. But, in spite of all the prunning, fertilizing and relocating to give it the perfect garden spot, plus going along with all the advices received from the well-informed staff of garden nurseries, it still refused to flower! Probably, it was barren? So, what do you think we did? Of course we bought ourselves another potted plant that was already flowering (though quite expensive!) and told ourselves never to buy one without a show of flowers as it could end up being barren as our first plant. How delightful…our young plant has finally rewarded us for the first time. It produced a single cluster with just two vibrant orange flowers last month, a little odd though, as it was downright small in numbers. where can I buy those kind of plants? Try your local garden nurseries, Susan. I would like Bauhinai Kockiana. Please advise me. 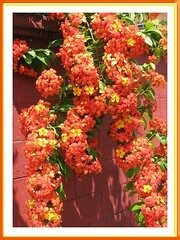 Try sourcing for this plant at your local nurseries, Mr. Adisai. 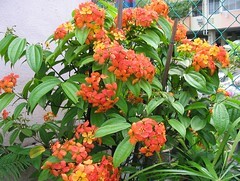 I know that in nurseries around Kuala Lumpur and Selangor, B. kockiana is popularly sold. LOL! I like your remark “like a candy store”…really made my day with your sweet perspective of this site. Thanks for your encouraging comment and taking the trouble to pen your thoughts which is much appreciated. Sorry though to disappoint you that these small nurseries that we normally patronize only cater to local demand, not for export. All the best in your search for this impressive vine, hope you get to grow it one day soon. What method do you mean…are you asking how to propagate the plant? If so, it’s already included in the article above. Nonetheless, I’ve never tried the air-layering or marcotting method myself, hence unable to advise you further. Hi Koppiemama! It’s okay without the growing tip. Divide your stem cutting into two (each about 12 cm long), at an angle with a sharp knife, making sure that the lower end is snipped about 1.2 cm below the leaf node. Remove the basal leaves, leaving only 2-3 leaves at the top end. If the top leaves are large, you can half their size. We’ve tried this way once with semi-hardwood cuttings and only one out of 3 cuttings rooted and survived. Hope yours will fare well. All the best to you! thanks for your advice. unfortunately, the cutting did not survive. Not sure what went wrong but i’ll try again should i beable to get my hands on another one soon. This plant is so beautiful! I’m thinking of getting one shipped to London, UK. However the weather here is not quite tropica lol! Do you think it can survive and bloom in our continental climate? Indeed, It is so beautiful, Anna! I think it can survive but unsure about blooming though, as it needs lots of sunshine to flower. One thing I’ve noted too is Bauhinia kockiana loves to be planted in the ground…ours are potted and they can be such a disappointment too…hardly flowers in spite of getting much sunlight? Walking on the beach in Far North Queensland and found a vine on a beachside tree with a fragrant white flower, 4 petals with 4 prominent long stamens. Leaf large lanceolate. Locals call it October Bloom. Peter, I did a search at Flickr.com and narrowed down to this….could it be Faradaya spendida? Check this out at emblatame’s (Ron) photostream. Your Bauhinia Kockiana story has given me hope! I’m a beginning balcony gardener in Singapore. I used to admire one of these plants when driving along a particular road. It was bent on taking over its neighbourhood by using the old telephone lines adjacent to the large property it was planted in. I’ve now bought my own (it came with one blossom) and have been looking for new growth. There are tiny signs in the form of little swellings at its tips. But I am worried about it because the leaves all seem to have a scorched tip. I wonder if I inadvertently overdosed with fertiliser. It’s definitely not getting too much sun and the soil is always moist though it is a very windy balcony. Should I worry about the scorched leaf tips? Am I right that it’s just a fairly slow growing plant? Thanks again for your beautiful blog. Thanks for your sweet compliment. Excess feeding can result in burnt leaf tips. Best to follow the instructions as printed on the package and if you’re using granules, scatter them in a broad circle about 5-8″ away from the crown or trunk of the plant. Check too that your container has proper drainage holes for free draining. On the contrary, I remember our plant to be quite a fast grower. Wish you success with your plant… may it bloom abundantly to delight you! Thank you for your advice! I was wondering if the soil might be a problem. Too much clay. I’ve repotted with a looser mix. I’ll let you know if it improves! 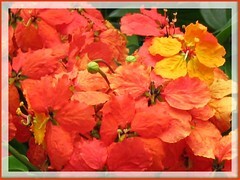 Hi Jacqueline, thanks for the beautiful site on Bauhinia kockiana, it has given me alot of knowledge and information. I love the plant alot cos it has beautiful flowers. I bought my B kockiana six months ago and had planted them on the planter outside of my house and only have afternoon sun. Desipte all the pruning, watering and fertilisering, they did not bear flowers at all. May i know what i did not do that they did not blooom? Appreciate your earlly reply. Hi Natalie! Frankly, we’ve never been successful in getting our B. kockiana to bloom well in spite of all the pruning, watering and feeding. Hence, we’ve given up planting it altogether. Probably, feeding it with a flowering fertilizer with a higher content of potassium (K) will help. I noticed that feeding other flowering plants of ours occasionally with chopped banana skins (high in potassium) that have been soaked in water for a couple of hours seem to stimulate production of more flowers. You’re most welcome, Jackson… we love sharing our knowledge! And, all the best to you… hope your propagation is a success. Hi Mai. You can try to contact Wellgrow Horti Trading @ http://www.wellgrowhorti.com …they may be able to source this plant for you. All the best.